These men's vests are handcrafted from your choice of heavy weight Pendleton® wool. The pictures show in-stock fabrics available to choose from. These options will be displayed for selection during the checkout process. If you want a different fabric, I’m happy to custom order it for you. Please convo me with your request. I’ll add your blanket as an available fabric for you then you can purchase your vest from this listing. Three weeks will be needed to complete these requests. 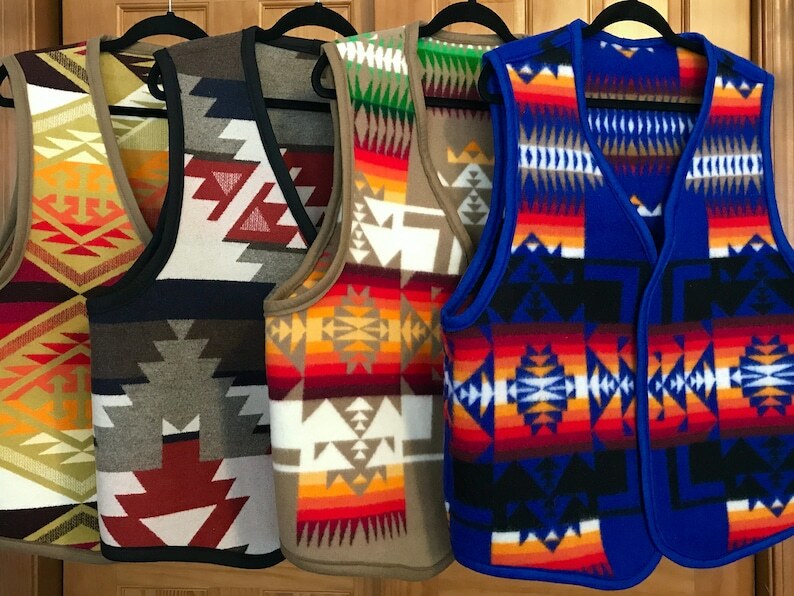 These are not ordinary blanket vests. Your vest will be reversible so you have two vests for the price of one! All seams in your vest are finished on both sides, and the edges are finished with a coordinating Pendleton® blanket binding. Vests are available in men's sizes Medium - XXXL, and are made to order to ensure you receive the fabric and size that you want so please allow up to 5 days for vest to be shipped. What a great gift for that special man who has everything and doesn't ask for anything! I am confident that you'll be very pleased with the durability and high quality workmanship of your vest. It was very well made and I was impressed on how the patterns matched on both sides of the opening. Very happy with the purchase. I did receive it just before Christmas but it sure took a long time to get here.